No matter what you think of Liberty University as an institution, whether you're in the thick of the controversy or casually observing, it's inevitably crossed your newsfeed or the chyron of your favorite cable news network. Ever the bastion of conservatism - social, political, and theological - Liberty espouses with flagrant pride the ideals of a people in power. As an institution intrinsically tied to the Southern Baptist Convention, its values are that of right-wing Christians, and love it or hate it, it's here to stay. Thanks in large part to the statements and actions of its partisan president, Liberty swings like a pendulum in and out of the news cycle with exhausting persistence. Ask any student on campus, and chances are they'll respond with exasperation to the give-and-take of controversies swirling around Liberty Mountain. Most recently, the news to reach beyond the Lynchburg bubble comes by way of the Convocation schedule, the mandatory thrice-weekly gathering students attend on campus. Regularly in the news, it's been home to campaign speeches, preeminent Evangelical pastors, and the expected slew of partisan hacks desperate to make headway in a cynical demographic. This week, Liberty's Office of Spiritual Development shared the upcoming lineup of Convocation speakers on social media. It includes Tomi Lahren, conservative political commentator and Fox News personality known for her rants against the liberal agenda, feminism, and her generally egocentric social media persona. She's followed by the only non-partisan individual in the lineup: Ray Rice. Once celebrated for his career as the Baltimore Ravens' running back, he's now known for beating his wife in an elevator to the point that she was unconscious. Following Rice is Corey Lewandowski, former campaign manager for President Donald Trump who was forced out of his position after assaulting a female Breitbart reporter on the campaign trail. Scheduled between Lewandowski and another Trump campaign official, David Bossie (Trump's former deputy campaign manager), is Steve Strang, writer of the book "God and Donald Trump". There are two common threads here: Donald Trump and violence against women. In other words, there's just one thread. In a year where Liberty has hosted political sycophants such as Dinesh D'Souza, Laura Ingraham, Jesse Watters, Anthony Scaramucci, and Jeanine Pirro, the political worldview of Liberty's most powerful administrators is, at the very least, deeply invested in Trumpism. No stream of alternative political ideology has been given the same consistent access to the student body as adherents to President Falwell's worldview, and despite appeals by University figureheads to the diversity of Convocation guests in the name of public relations, I know not how an appearance by Senator Bernie Sanders years prior constitutes political diversity. The exception does not prove the rule. The relative political homogeneity of these guests perfectly illumines the political realities President Falwell wishes espoused by the institution he inherited. While he publicly defends the political diversity of his student body, nothing his administration has done legitimizes this stated belief. It's quite the opposite. Such is the problem: the President of Liberty University has leveraged his platform into a position of power, using partisanship as a means to apologize for racism, sexism, corruption, and violence of all kinds. He defends sexual predators, disbelieves women who accuse powerful men of harassment, articulates a vision of White Christian Nationalism, and manages his institution in an authoritarian manner most recently evidenced in the forced removal of Pastor Jonathan Martin from a concert under the guise of security concerns. Don't tell me it's just his personal endorsement: everywhere he goes, whether on Fox News or the Republican National Convention, the name "Liberty University" is front and center. The claim his political activity is entirely separate from his role as President is a lie - the two are inextricably linked. Our Convocation schedule continues to prove what we've all recognized. President Falwell is everbody's problem, and he must go. In the days following the release of the schedule, the collective groan from Liberty students, punctuated with outright anger, has been expressed by way of meme, tweet, and Facebook post. For some, indifference to the larger problem remains the only path forward. Perhaps internally discordant, otherwise sanguine, the rallying cry of those content to maintain the status quo is one of "he doesn't represent the student body" followed by a passionately invoked "the Liberty I know is so much more than its president". I'm not here to disagree with your experiences. Nonetheless, like a bandaid to a growing wound, the absolution provided by statements that distance oneself from the controversy is fleeting, woefully inadequate to meaningfully address the top-down politicization taking place. We intuitively know these Convocation speakers are invited thanks to connections established by President Falwell's partisan activities. His regular appearances on Fox News and other national platforms are intended to appeal to the white Evangelical base that overwhelmingly supported his favorite candidate, Liberty University's Commencement 2017 guest of honor, President Donald J. Trump. Regardless of your spiritual experiences, community, and memories at Liberty University, President Falwell presents a contrasting image to the Christ much of Liberty's student body would seemingly prefer to follow. This is my appeal to you students, faculty, and all associated with the University: President Falwell's continued partisanship and abuse of authority to promulgate his worldview will only get worse lest a real and meaningful response is given by those to whom he is ultimately responsible. The public statements, controversy, and the increasingly frequent appearances by Trump-related guests demands a forward and honest rebuke. Students, you cannot expect your idealism with regards to Liberty's climate to hold much longer. At what point will President Falwell cross the line for you? When do you cross the threshold from apathy to genuine concern? What will it take? If it wasn't his 2015 comments regarding Muslims, his endorsement of Donald Trump, his defenses of Trump after the Hollywood Access tape was revealed, his comments on national television, inability to condemn white supremacists, or his forced removal of Pastor Martin from Liberty's campus just a few weeks ago, what will it take? No matter how hard you try and disassociate the two, President Falwell and Liberty University are inextricably linked as long as he remains in power. He's still your president, and he still speaks on behalf of your university. If you care for your school and genuinely believe it to be defined by the good you know it possesses, will you be willing to fight for that with the understanding that President Falwell poses a direct threat to these ideals? It doesn't take much to know my personal views stand at odds with those of Liberty's institutional values, but that doesn't disqualify me from speaking up in hope for a change I believe possible. I'm still a student equally invested in this place; I'm not fighting for a progressive Liberty - I'm fighting for one rid of the cancer of white Christian Nationalism. Whatever your views on a variety of subjects, we can agree that President Falwell is toxic. He does not adequately represent his student body, his faculty, or his alumni. His politics do not represent Christ. And it doesn't have to stay this way. I'm not here to prescribe a specific course of action - I'm here to encourage your dissent. So make some noise. Protest. Stand up to administrators for their silent complicity. Write. Speak. 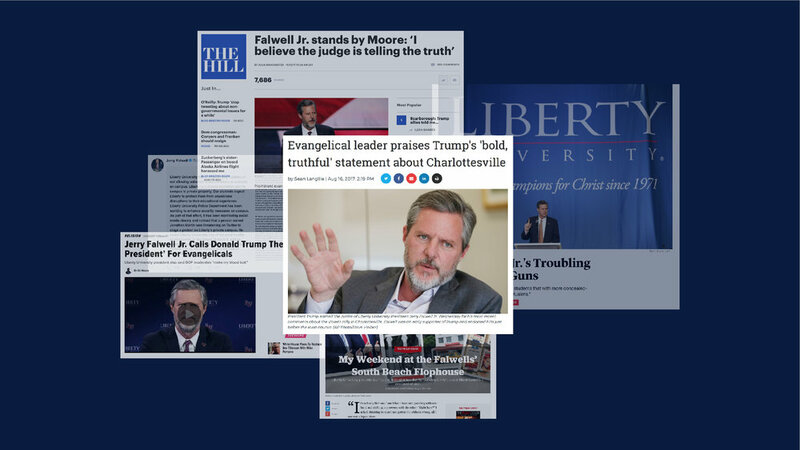 Use social media, blogs, email, and make it clear to the university's leadership that President Falwell is not fit for his job. Liberate Liberty, and show the world the good you know by fighting for it.